We'll be helping a fellow with a unique problem in this installment of Ask the Bastards. 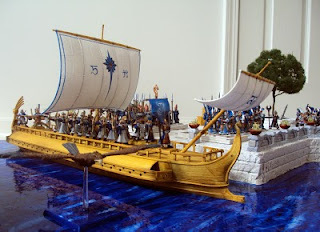 I've created a display board for my High Elves which features a ship and a stone pier. As a whole I'm happy with the look of the display but as individual units on the tabletop, the units look disjointed - especially considering the bases don't all match. The bases of minis on the ship don't match the stonework bases of everything else. What is the best remedy for this? Should I do away with the ship and base everything the same? Or keep the ship and live with difference on the tabletop? That is an awesome display base! It looks like a lot of nerd love went into the thing so I would not advise you to scrap it altogether. You created a compelling scene there. I do see how they could look disjointed on a generally green table top, though, between the white cobblestone dock-jockeys and the wood grain shipmates (not to mention the blue of the beaky bird). If we're keeping the display board we won't be able to get rid of that altogether, but I think we can tone it down with a simple fix. Paint the edges of the movement trays and their bases black. This will tie them together with a common base color as well as create another interesting contrast. They should look much more uniform on the tabletop and I really think they might even look better on the display. Painting the edges black sort of acknowledges that a base is a base, no matter how you try to disguise it into the display piece. Optionally, you could shoot for some sleeker movement trays painted completely black to really tie the disparate units together. This might work against the display board, but maybe not. Experiment a bit and let us know what you come up with! I saw this display base at Core Comp. I thought it looked really sweet. 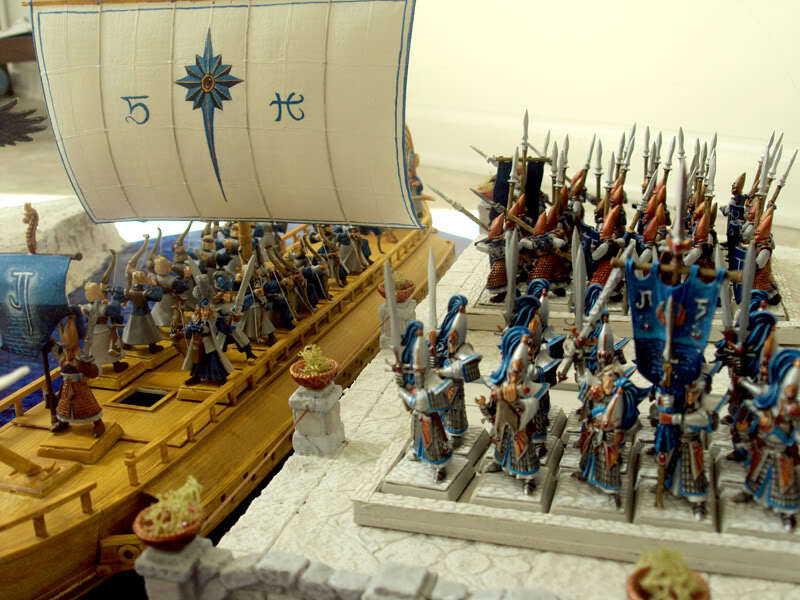 The boat looks great, awesome detail, and very themey for the High Elves. The pier also looks great, and very High Elf-y. I say keep the base. No one is going to have bases on their army that match the table tops at a tourney, so who cares that yours don't? You've clearly put a boat-load of time into this display (pun intended). Does the difference in bases distract from your enjoyment of the army when you're playing? If so, and it's really important to you; maybe some additional movement trays would pull things together. Mix up a color shade between the white and the tan of the boat and the pier. Paint the sides of the new movement trays that new mid color, and paint the tops of the move trays the same color as the top of the model/unit bases. Use different move trays for the display, and for the game. Seems like a real pain in the behind though. If it were me, I'd keep it. It looks great, it's well done, and it's really nice to see something unique with an army display board. First off, the display base is AMAZING. You should not consider, under any circumstance scrapping the ship. It totally makes the army and it's the first thing that folks remember when they think about your army. So how do you make units with different bases work in the same army off the display base? There are actually a few decent options. The first, as Joe mentions, is a strong one. Simply find a complementary color for the army color palette that works with all of the base colors. Paint all the base edges in with this color to tie the units together. If you use a dark color, like black for instance, it will de-emphasize the edges while providing excellent contrast for your light colored miniatures. Second option, also mentioned by Joe, is to go with some slimmer movement trays. This would only leave the base top surfaces clashing. In particular you should check out the ready made Flanged Steel Trays made by Shogun Miniatures. I purchased these trays to go with my High Elf army and they are great. You just glue magnets in bottom of the bases and voila. The flange that comes up on three sides does not rise above the height of a 28mm base. If painted the same color as the base edges can't even see the tray. Finally, there is one last option which I think, in my opinion, may be the best. Rather than trying to hide the differences, you should play them up. To make this work use the various base colors (wooden brown, cream and blue) as spot colors on the other bases and movement trays to tie all the units together. You could even take it a step further and further enhance your display base in the process by some clever modeling. Here are some examples of what I'm suggesting. On the eagle's ocean base add a small chunk of wooden planking or drift wood in the same color as the ship decking floating on the surface of the water. If you have another eagle (and I KNOW you do) mount it to a stone stature in the cream color rising from the water. For the units that have the stone work add some barrels or rope in the ship decking color to the edges of the movement tray or on some of the bases. You could also work in a small unit filler of stacked creates in the ship decking color (which you have already modeled) or some sort of water feature like a fountain to bring in the water color. On the wooden bases maybe add a couple of stone bases interspersed into the unit to create a "parkay" look. You could also add some small stone posts to the front of the wooden based movement tray connected by some chain. The ideas are endless but the goal remains the same. Share the base colors across the whole army so that all the units use the same wood, stone and water colors. I gotta disagree with Joe though. I wouldn't edge anything in black. To me it will make everything look like an eyesore while it is sitting on the base. Thanks for the feedback guys! Rob - I especially like your suggestion of adding elements from the different bases to other areas (white rock on water bases to break them up and tie together). I will have to try that. I may also try adding additional units on white bases to be gaming units versus display units. However that's a fairly large modelling/painting commitment...anything for those extra tournament points though! I'll keep these suggestions in mind as I forge ahead on new WHF projects. Thanks Bastards! One way to make things a bit easier if you decide to go with separate display and gaming bases is to put a pin in the models feet. Then you can swap the bases out without having to paint two versions of the same unit, which would be akin to pulling teeth. I did something similar with by putting pins in a Liche Priest so he can either stand on the Casket or on a separate base. Or course with 8th edition I no longer really need that option.